My name is Roger Albert Humbke – b. July 20, 1943, Wetaskiwin, Alberta, Canada. My parents, Lawrence and Marvaline Humbke (Vanouck), were married on Nov. 15, 1937 and lived on his father’s homestead 11 miles East, 2 miles South and 1/2 mile East of Wetaskiwin, Alberta. Both were born on homesteads 1/2 a mile apart and went to a one room rural school which my grandfather and relatives helped to build in 1902. 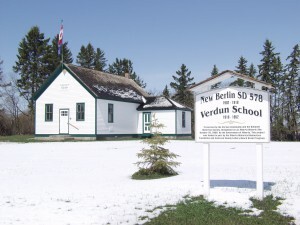 The school was originally named “New Berlin” but had its name changed in 1918 to “Verdun” (after the WW I battle that involved Canadian Troops). Sentiment against Germany created the fear that the school may be damaged or set on fire. Humbkes in Canada could not tell me where my great grandfather was buried, so in 1999 I spent two weeks in Courthouses, local libraries and civic buildings in South Dakota and Iowa going through primary documents, deeds, bills of sale etc. Tracing the family’s movement from Germany to South Dakota and then to Iowa, my great grandfather’s grave was discovered at the Immanuel Lutheran Church cemetery, Hancock County, Iowa. It was learned that he had died as the result of an accident while unloading logs to build that church, 100 years previously on July 21, 1899. It was unfortunate that I arrived at the church the day after the community had held their 100 year celebration of the founding of the church and the minister told me that I was the first Humbke, which he knew of, that had returned since the family left in 1902. His widow (Marie Louise Humbke), and the rest of the family, with the exception of one married daughter, left by train from Woden, Iowa for Alberta, Canada in 1902. In most cases I like to read and write about the past before I get into the present, so I am starting with my Great Grandfather, Ernst Dietrich Christian Humbke – a German farmer who came to North America in 1883 with his wife (Marie Louise Schnepel), 5 of their 9 children and his younger brother from Windheim, Germany. In my North American travels and when people had phone books, I use to look up the name Humbke and ring the number. I seldom found the name spelt Humbke, but if I did – we were related. If you’re interested in your ancestors, relatives, their families, where they lived, what they did and where they are buried, leave me an email address where you can receive information. It goes without saying that I need help in filling in all the blanks and would love to receive information, stories and photos about you and your family. My email address is roger@humbke.com. A large amount of the information on this website is from secondary sources (family and local histories, newspapers, family stories etc.) which are often written later . Primary sources (civil, church, census, military, immigration, wills etc.) are used to verify data and will result in numerous changes, as new information regarding photos, names, locations, dates and activities becomes available. Please drop me a comment below. I would appreciate your feedback and will consider all suggestion to make this a more informative, useful website. Researching family is always interesting and you have a very rich heritage. Congrats on finding all you have. I’ve worked on family Geneology and it’s interesting, time consuming, frustrating, confusing, and very rewarding. You have hit the nail on the head, when you wrote time consuming and rewarding. I especially like finding traits in ancestors showing up in myself or living relatives. Now to figure out how those findings can help me lead a more fulfilling, enriched life. Go Roger… your heritage with hindsight, insight and foresight! It’s because of you we are all in a better place! Though our parents and grandparents likely never knew each other, my paternal family came to New York from Gamshurst, Germany in 1794. Who knows, they could have known each other in years gone by, and that is why we feel ‘the connection’. Some day we should get together just to share our respective heritage detils. Over the past 30+ years I have been trying to get the facts on Buhler, (then changed to Buehler when they arrived in the USA). My heritage line is relatively easy, this is the way I can remember it… from Germany…, Nicolas, to Nicholas, to Augustin, to John, to John, to John then to Lawrence John-(that’s me) in Calgary & CR! Where my father’s father (Humbke) came from in Windheim, Germany is about 500 Kilometers North of Gamshurst. My mother’s father’s father (Van Ouck, Vanouck) came from Baden Baden which is very close to Gamshurst so I am sure that, if we go back far enough, we are related. It is probably the reason we are such good friends and admire qualities that we have in common. I look forward to discovering more. Perhaps one day we will take a trip to Germany and have a beer in a pub that our ancestors frequented. Interesting history. Good luck with your research and endeavour. Thanks for the reply Simon. I at least have the “Comment Box” working now. I do have a lot of information, but it will take awhile to get it on the web site.